Like a lot of newer, more inexperienced hams, I have had a fair amount of trouble soldering PL259 connectors to coax. In my previous posts, about my portable station, I need some small coax jumpers to bring the antenna connectors down to the lower front of the box. That portion is not show in my posts yet, as I’ll write about that later when it’s done. I tried my 40 watt Weller thinking it would work, but it didn’t hold enough heat. I have come to realize that PL259’s are big heat sinks. They drain heat from the soldering iron tip, so you need something that can hold a lot of heat. Namely a larger tip on the iron. 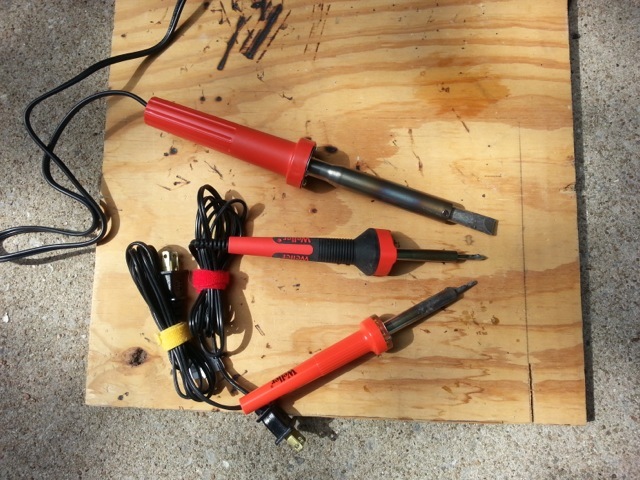 In the above picture, are my three soldering irons. The center one is a 25 watt model. It has a pencil type tip. No good for PL259’s but it’s good for other things. The bottom one is a 40 watt model with a small chisel tip. While the tip is larger, it’s still much too small. I know on ham forums on the Internet, there will be someone who will claim they can use this iron and successfully put on a PL259, but for most of us mere mortals, it’s not what we need for the job. The upper iron in the picture is my new soldering iron. It’s a Weller SP120. It’s 120 watts with a huge tip as soldering irons go. I was able to put two PL259’s on and make a jumper cable in about 10 minutes. Most of that time was spent stripping the coax carefully with my x-acto knife. The right tools are sometimes needed and for me and soldering PL259’s, the right tool is a nice larger soldering iron!